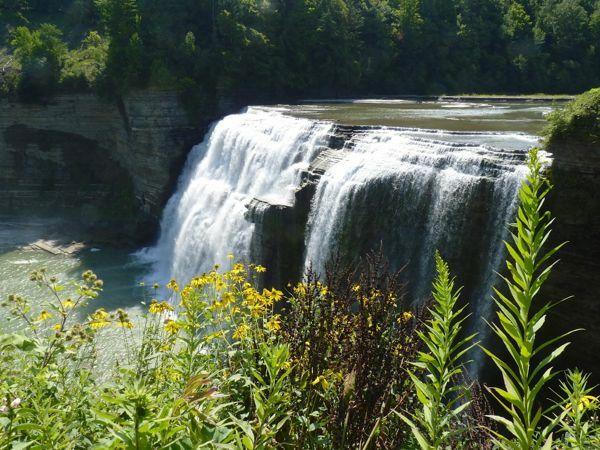 All reports said not to miss Letchworth State Park in western New York. 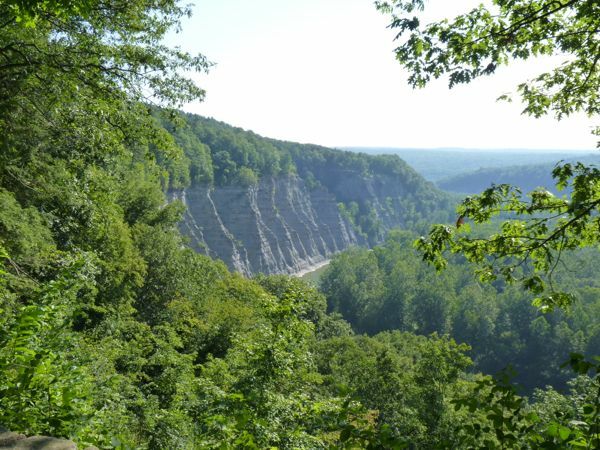 It is billed as the Grand Canyon of the east. While it is impressive, I would not rate it in the same category. Most of the sights are in the south end of the park, while the campground is in the north. Since I didn’t need to camp, I played tourist for the day. The order of pix is from north to south. Tea Table is a rock formation that juts out into the gorge. The photo doesn’t actually show the Table, since I was standing on it. It is so named because, in the early days, folks would come out from town for tea on the ledge. Wolf Creek empties into the river gorge with several cascades. The photo is near the top and before the dramatic drop to the river below. A better view was not accessible. The water seemed low, so they were not as impressive as they would be in the Springtime. 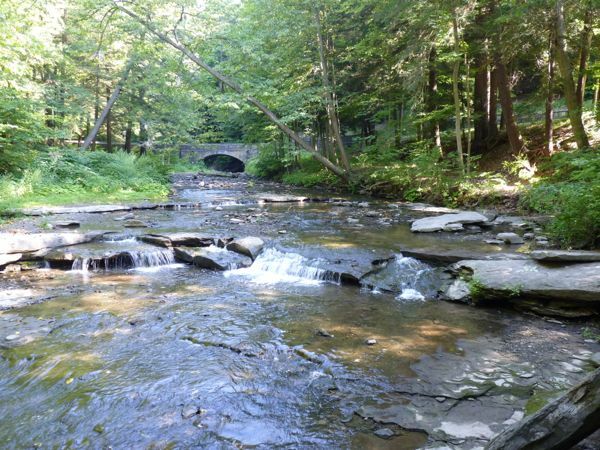 It is one of fifty such streams with falls emptying into the river. 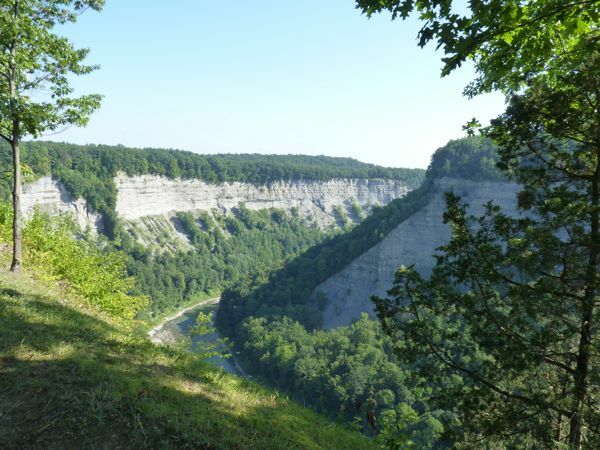 The Genesee River runs the whole length of the 17 mile long park, cutting a deep gorge along its path. Cliff walls rise up to 550 feet, and are as little as 400 feet apart. The river takes a wide S turn providing spectacular views at the Great Bend. Perhaps this is where it got the nick-name. I imagine it would look even more dramatic with fall colors. 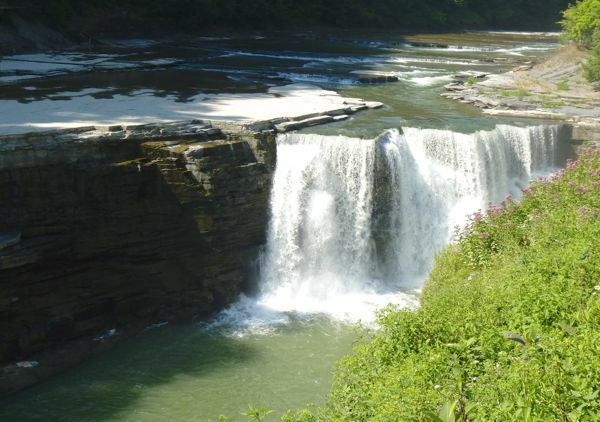 Lower Falls is the shortest of the three major waterfalls, but is the widest. In the Spring, water would be falling all the way across the gap, which would make it appear much wider. This shot doesn’t due it justice. There is a trail with 127 steps down to the viewing area, and it continues over a foot bridge that spans the river. Seen from Inspiration Point is Middle Falls, and in the distance, Upper Falls just below the Norfolk Southern Railway Trestle. 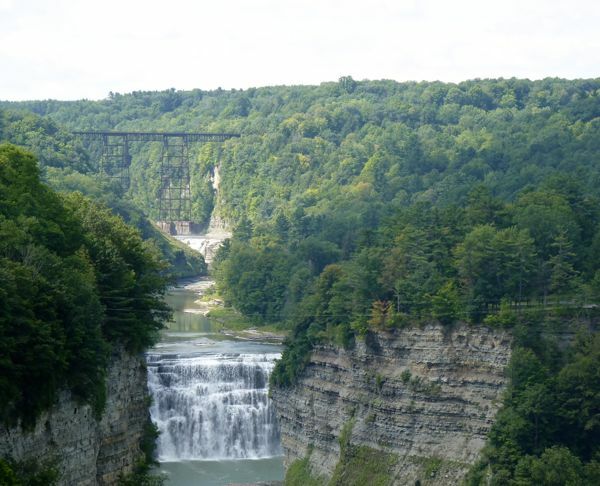 Built in 1875, the span is 234 feet above the river, but appears even higher due to the proximity of Upper Falls. The trestle is scheduled to be removed in the near future. Upper Falls seems the most impressive. But, due to the extensive development around it, and subsequent number of tourists, the charm is lesser. The Iris Inn is adjacent to this waterfall, and the museum is across the road. Also, the Trestle viewpoint is just a short distance away. I took lots of photos, but had to be selective. There are other sites to see in the park besides the river. The historic Iris Inn, a museum, visitor center are examples. And there are many trails if you are into hiking. I’d say it is well worth a visit. When I reached the end of the park, I headed toward my next camp. I have never heard of it. I’m glad you are still taking pictures of your travels. Great post! I’ve not heard of this either and it’s only a days drive away. Thanks! Nice post – we stopped there and enjoyed it very much. 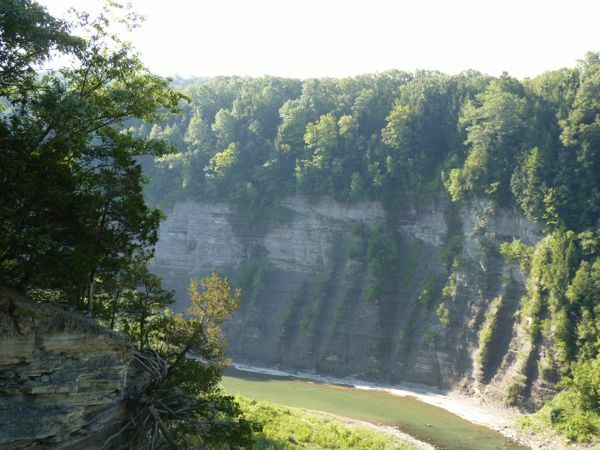 I grew up in Erie, PA so our family used to camp at Letchworth. I didn’t remember anything about it, though. Thanks for the memories. Leave a Reply to Brad Click here to cancel reply.